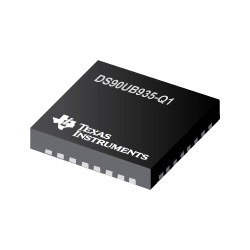 The Texas Instruments DS90UB935-Q1 serializer is part of their FPD-Link III device family intended to support high-speed raw data sensors including cameras, satellite RADAR, LIDAR, and ToF sensors. The chip provides a high-speed forward channel and ultra-low latency, bidirectional control channel and supports power over a single coax (PoC) or STP cable. The device offers advanced data protection and diagnostic features to support ADAS and autonomous driving. Together with a companion deserializer, the device produces precise multi-camera sensor clock and sensor synchronisation. The device is fully AEC-Q100 qualified with a –40C to 105C wide temperature range. AECQ100 qualification comprises HBM ESD Classification Level 3A and CDM ESD Classification Level C6. The serialiser comes in a small 5mm x 5mm VQFN package for space-constrained sensor applications.